The standard chantenay type carrot for decades. 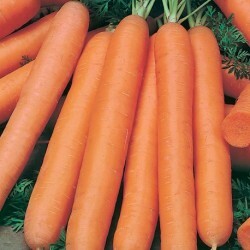 The 5-7 inches long roots make this carrot an ideal choice in shallow soil. Smooth sided roots that end in a blunt tip. Red core chantenay produces fine tasting roots. The broad shoulders and strong tops make the harvest easy. Early variety, 70 days after germination to full maturity. Growing your own carrots from seed is easier than you might imagine. Carrots can be one of the easiest vegetables to grow and when given the right growing conditions, can be a great addition to an edible garden that can help feed you and your family. Whether you have a large garden or only a small outside space, you can grow carrots from seed and satisfy that urge for fresh, healthy, crunchy carrots that you grew yourself. Carrot seeds need a well-prepared growing area. Try to plant them directly into very stony or compacted clay soils and they will tend to split and fork. While some forking is not a problem and misshapen carrots can taste just as good (if not better) as 'perfect' shop bought ones, it can also be a sign of less healthy plants.The first thing to decide when preparing your growing area is whether your own soil is suitable or whether you would be better to either amend the soil or, and this is often the best idea, create a new raised bed in which to sow and grow carrots. Mixing some sand with compost in a raised bed will create a free-draining and yet moisture retentive growing medium that will keep carrot seedlings very happy. You can plant carrots every two weeks or so throughout the growing season for a continuous supply of carrots throughout much of the year. Bear in mind, however, that in colder climates, late sowings of carrots will need to be protected from the worst of the winter weather. This protection can be in the form of a polytunnel or cloches. (You can even make your own cloches for free from old plastic drinks bottles cut in half. )You can begin direct sowing carrot seeds around 3 weeks before the last spring frost date, on a day when the ground is workable. Do not sow carrots in ground to which fresh manure or even rotted manure has been recently applied as this can cause forking. Create drills (grooves in the soil) at least 3 inches (7.5cm) apart and thinly sow carrot seeds into these drills. A handy tip is to sow a few radish seeds into the drills along with your carrots. These radish seeds will germinate much more quickly than the carrots and can mark the rows for you while you are waiting for the carrots to appear. 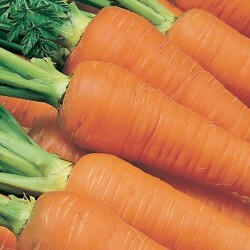 They can then be eaten before the carrots will need the space to grow into. Gently cover the drills over and wait for the seedlings to appear. Once the seedlings have appeared, you should make sure carrots get enough water during dry periods and can reduce moisture loss from the soil by gently mulching carrots with an organic mulch. Household compost, straw or leaf mould will work well. Wait until carrot stalks are at a reasonable height before mulching and so not crowd stems. Leave a space around each plant to prevent rotting. Mulch can also help to keep down weeds. 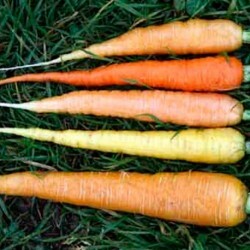 Carrots do not really like competition and so you should pluck out weeds when they appear. However, you can and should plant other species alongside carrots – onions, for example, will help repel common carrot pests such as carrot flies. When carrot seedlings begin to get too crowded, you should thin them to around 3 inches (7.5cm) apart. 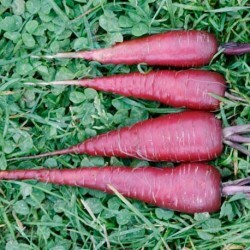 Do not throw those seedling away – those little carrots are great in salads – your first taste of home grown carrots. 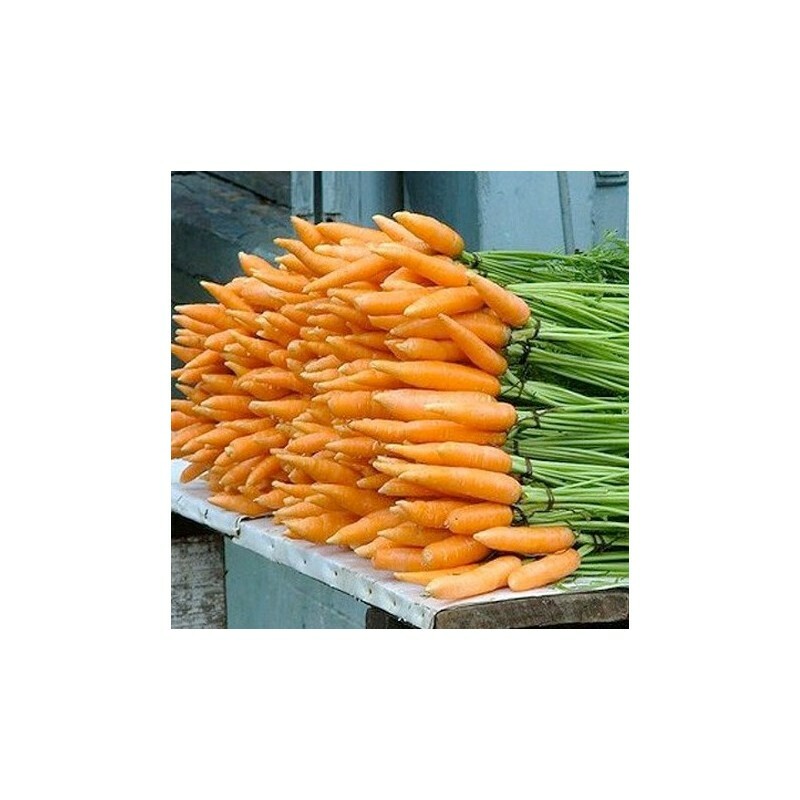 You can harvest carrots small or large but generally speaking, carrots are ready to harvest around 12-16 weeks from sowing.